First trade edition. 152 pgs., 2000. 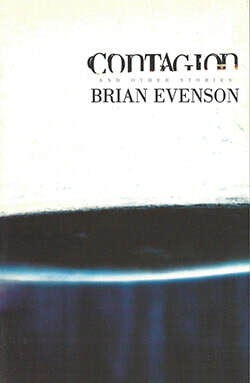 Brian Evenson's third collection of short stories. Several of these stories have settings in the American West. Includes 1998 O. Henry Prize story, "Two Brothers" and O. Henry Prize runner-up, "The Polygamy of Language". Cover design by Eric Lyman. #22 in the Wordcraft Speculative Writers Series. Mapping a literary space uniquely its own, Evenson's Contagion and Other Stories pursues to a new level the crepescular and delirious exploration begun in his acclaimed and controversial collection, Altmann's Tongue. In the O'Henry Award winning "Two Brothers," a minister break his leg while his sons watch then refuses to call an ambulance, remaining convinced even unto death that God will arrive to lift him up and make him whole. The self-acclaimed language specialist of "The Polygamy of Language" indiscriminately blends linguistics with murder. "Contagion" is a skewed retelling of the early history of barbed wire, which interweaves metaphysics and the Western genre. "Watson's Boy" show a boy endlessly wandering the human equivalent of a conditioned response box while the protagonist of "By Halves" finds himself trapped in a relationship that may not exist. Throughout, Evenson's immaculate prose draws us mercilessly up to confront troubled and troubling lives that, astoundingly, are no less human than our own. "Readers of Ballard and Burroughs will exult in Contagion -- a brilliant rageful, necromantic and philosophic swarm of nightmares and lingering fevers." -- Rikki Ducornet, author of The Fanmaker's Inquisition and The Word "Desire"
Brian Evenson's collection of stories, Altmann's Tongue, was published by Alfred A. Knopf in 1994. Wordcraft of Oregon published his second full collection, The Din of Celestial Birds (out of print). This is his third full story collection. In addition, Evenson has published two other works of fiction, One Thick Black Cord and Prophets and Brothers. He has lived in Central America and Europe. More information can be found on his website at www.brianevenson.com.